To pay off a bet on the World Series he lost to close friend Dwyane Wade, Cavs forward LeBron James will wear a Cubs cap, jersey, pants and socks to Friday’s game in Chicago before the Cavaliers play the Bulls. James made a friendly wager on the World Series between the Cleveland Indians and Chicago Cubs with Wade, his former Miami teammate and Chicago native who returned to play in his hometown this season. The Indians lost in seven games as the Cubs rallied from a 3-1 deficit to win their first championship since 1908. And that will be quite a sight as the 6-foot-8, 250-pound James isn’t built like any baseball player. 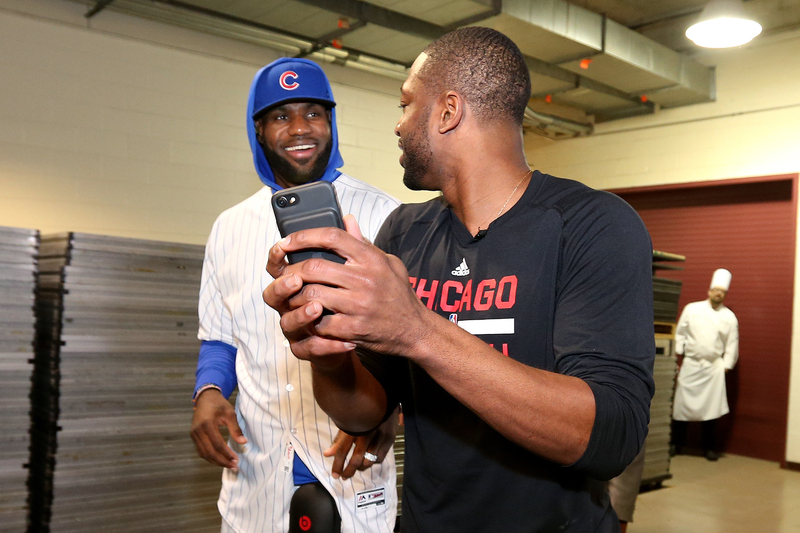 LeBron James #23 of the Cleveland Cavaliers arrives to the arena wearing a Chicago Cubs uniform and takes a picture with Dwyane Wade #3 of the Chicago Bulls before the game on December 2, 2016 at the United Center in Chicago, Illinois. It’s a bit easier to make good on his bet since he led the Cavs to the NBA title in June, ending Cleveland’s 52-year championship drought. James and Wade played together for four seasons in Miami, leading the Heat to two titles and four straight NBA Finals appearances. James said it will be different to see Wade, who signed with Chicago as a free agent last summer, in another jersey. ESPN.com and The Associated Press contributed to this report.